이 탑은 고려시대의 승려 지광국사 해린(984∼1067)을 기리기 위한 것으로, 원래 법천사터에 있던 것인데 일제시대에 일본의 오사카로 몰래 빼돌려졌다가 반환되었으며, 경복궁 경내에 있다가 보존처리를 위하여 국립문화재연구소로 옮겨졌으며, 기단 네 귀퉁이에 있던 사자상도 국립중앙박물관에서 보관해오다 탑과 함께 옮겨졌다. 일반적으로 통일신라 이후의 탑이 8각을 기본형으로 만들어진 것에 비해, 이 탑은 전체적으로 4각의 평면을 기본으로 하는 새로운 양식을 보여준다. 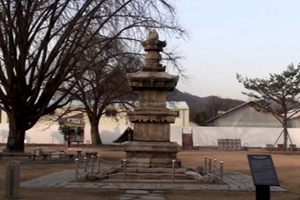 바닥돌은 네 귀퉁이마다 용의 발톱같은 조각을 두어 땅에 밀착된 듯한 안정감이 느껴지며, 7단이나 되는 기단의 맨윗돌은 장막을 드리운 것처럼 돌을 깎아 엄숙함을 느끼게 한다. 탑신에는 앞뒤로 문짝을 본떠 새겼는데, 사리를 모시는 곳임을 표시하기 위함이다. 지붕돌은 네 모서리가 치켜올려져 있으며, 밑면에는 불상과 보살, 봉황 등을 조각해 놓았다. 머리장식 역시 여러 가지 모양을 층층이 쌓아올렸는데, 비교적 잘 남아있다. 법천사터에는 지광국사의 탑비가 그대로 남아있는데, 탑비를 세운 때가 고려 선종 2년(1085)이므로 묘탑의 조성시기는 국사의 입적 직후인 1070∼1085년에 세워진 것으로 보아야 할 것이다. 탑 전체에 여러가지 꾸밈을 두고, 4각의 평면을 기본으로 하고 있는 등 자유로운 양식에 따라 만들어졌는데도, 장식이 정교하며 혼란스럽지 않다. 화려하게 꾸민 장식으로 인해 엄숙한 멋을 줄어들게 하고 있지만, 고려시대에 만들어진 탑 가운데 다른 어떤 것에 비할 수 없을 만큼 우수한 작품이다. 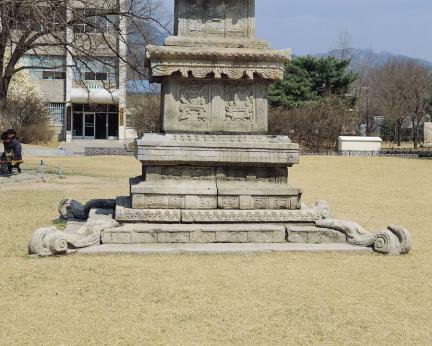 This funerary stupa honoring eminent Goryeo monk and State Preceptor Jigwang (pen-name: Haerin, 984-1067) was originally located in Beopcheonsa, a Buddhist temple once located around today’s Wonju. 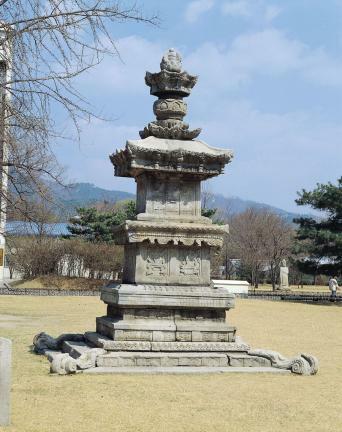 It had been smuggled into Osaka, Japan during the early 1910s when Korea was under Japanese colonial rule (1910-1945) but was soon returned to be housed in the precincts of Gyeongbokgung Palace where it is today. 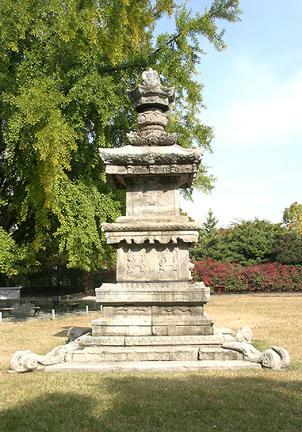 Unlike ordinary stupas that came to have an octagonal shape after the Unified Silla era (676-935), this one is basically square in plain view. 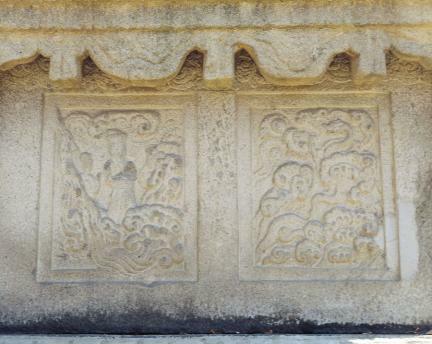 The foundation stone has four decorative carvings shaped like a dragon’s clawed foot tugging the ground on all four corners, creating a great sense of stability. 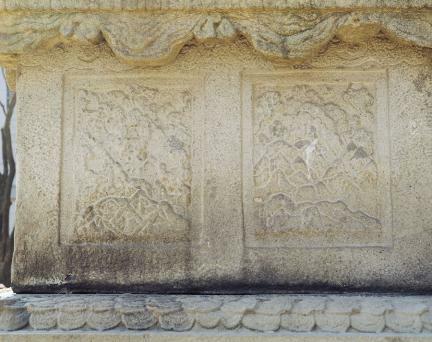 Above the foundation is a base of seven tiers with different heights and widths whose top tier is decorated with elaborately carved draperies over all four sides. 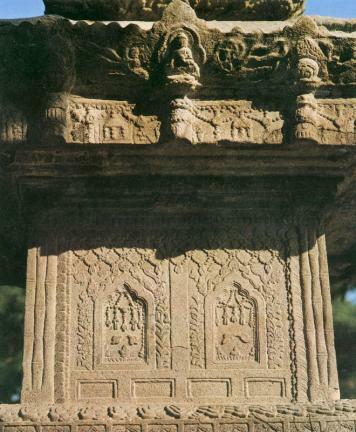 The main body is in turn carved with a pair of doors on the front and back to indicate that it contains a chamber enshrining the relics of the dead monk; the roofstone is gently turned up on all four corners, with all its eaves elaborately carved with Buddhas, bodhisattvas, and phoenixes. 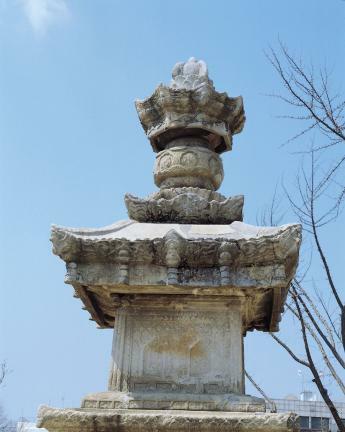 The finial is also in good condition. 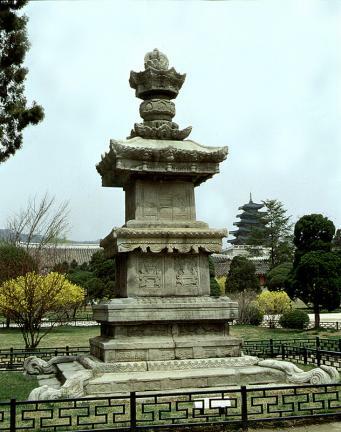 Meanwhile, a stone stele set up to mark the construction of the stupa is still standing on its original location at the Beopcheonsa Temple site. 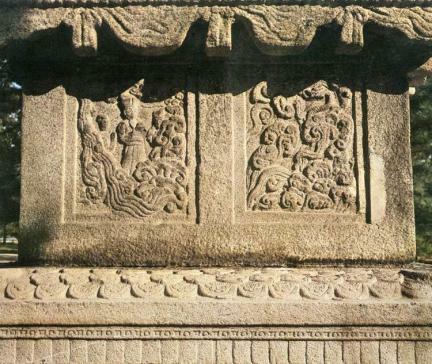 The stele contains an inscription stating that it was set up in 1805; thus suggesting that the stupa was built sometime between 1070, the year when the preceptor died, and 1085 when the stele was set up. 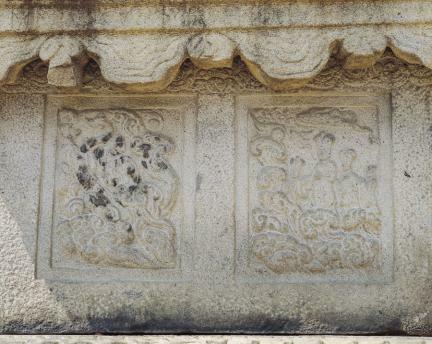 The stupa is covered by decorative carvings of various subjects arranged in a seemingly unrestrained manner, but none of the details confuses the viewers thanks to the basic square structure and masterfully executed carvings. 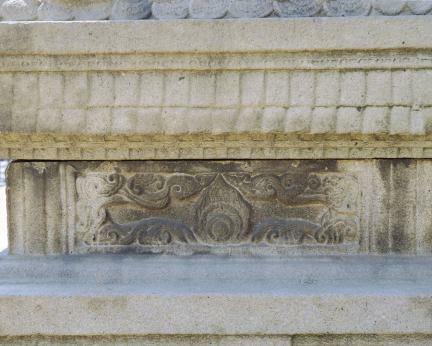 While some argue that the stupa has excessive decorations and consequently tends to reduce the solemnity it should maintain as a reliquary monument, it is generally regarded as one of the finest of its kind produced during the Goryeo period (918-1392).